Paul Joseph Watson, a writer at Prison Planet whom I greatly respect, gave us a reminder Monday May 17th that Obama Czar Wants Mandatory Government Propaganda On Political Websites. The Big Brother Czar is also a Harvard Professor currently dishing up the pabulum for Obama’s White House that “conspiracy theories” should be banned from the Internet; so much for Harvard, Czar-Dr. Cass Sunstein and intellectual freedom. Sunstein’s tonality is reminiscent of Joseph Goebbels New Years Address for 1939. What’s more Sunstein wants to “legally force” Americans “to do what’s best for our society” and water down their free speech (granted by the US Constitution), by mandating websites with pop-up links to opposing government propaganda be “forcibly included on political blogs.” Could we have such pop-ups when the President is speaking, Henry Kissinger, Bibi Netanyahu, AIPAC, Larry Silverstein, NIST, Fox News, Lloyd Blankfein? Coincidentally, the also Harvard educated Constitutional lawyer now President, Barack Obama, agrees with Sunstein and has knighted him “Head of Information Technology in the White House for ‘Conspiracy Theories,’” i.e. any political thought that doesn’t regurgitate establishment views, like Obama’s ties to the CIA at Columbia University and after. Those who talk truth to power will be taxed or banned. I hear the clicking of boot heels as Sunstein speaks and I write. In fact, Sunstein’s “thinking” came from a rather sullied “White Paper,” in which he talks about countering “dangerous ideas” and “taking those who disseminate such theories” to where? Prisons like Hitler’s camps, Stalin’s Siberian gulags. These dangerous ideas and/or theories would include “some held by the vast majorities of Americans,” such as the incredible body of facts that prove the JFK assassination was part of a wider plot, including the CIA, Big Oil, the Mafia, the defense industry, and a combination of assassins. Sunstein is such a patent ploy for the New World Order that he should wear an “NWO” armband, perhaps a skull and bones on his lapel. Sunstein adds to his hit list that believing “global warming is a deliberate fraud” is another theory government censorship should stomp its black boot on. Frankly, whether you or I believe in global warming or not is our business and constitutional right, and not his. Sunstein calls “false and dangerous” the idea that exposure to sunlight is healthy, despite certain medical experts that agree prolonged exposure reduces risk of developing certain cancers. Again, whether it does or doesn’t is a matter for open discussion in a democratic society. Choices of credence should be made by individual physicians and lay people according to their patients and health. Basically, this crypto-Nazi wants to write into law that government should dictate “the very nature of reality to Americans and that their opinions can only be voiced at best when accompanied by mandatory federal propaganda or at worst that Americans can be silenced entirely by federal decree,” as Watson writes. He also points out that our Supreme Court nominee Elena Kagan argued “that the government can ban books and political pamphlets.” What’s going on there at Harvard (where Kagan served as law school Dean) that cries out for such repression? Tom Paine must be turning over in his grave. The “complainers” that Goebbels was referencing were the intellectuals, writers, journalists, activists, the Internet bloggers and questioners of their day, who had criticized Hitler’s barbaric behavior, including the burning of the Reichstag, which Hitler and the Nazis blamed on the vision-impaired, Dutch left-wing radical Marinus van der Lubbe, who later was tried by them and beheaded. Or course, after successfully lying that the communists, not the Nazis under Goebbels direction did it, Hitler went on to create the “Enabling Act” which enabled the Nazis to strip away most of the civil rights of Germans, as did George Bush’s renewed PATRIOTACT for Americans, and which this author would like to see banned forever from our laws. But after praising the “miracles” [read violence] that brought the Nazis to power, Goebbels goes on to say, “This ability to believe is rather weak in some circles, above all in those with money and education. They may trust more in pure cold reason than a glowing idealistic heart. Our so-called intellectuals do not like to hear this, but it is true anyway. They know so much that in the end they do not know what to do with their wisdom. They can see the past, but not much of the present, and nothing at all of the future. Their imagination is insufficient to deal with a distant goal in a way such that one already thinks it achieved.” I assume that distant, imagined goal was the fall of the Third Reich a decade later, leaving Germany in ruins, poverty and disgrace, a path on which the US may be dangerously in its pursuit to world hegemony. We perceive only what they see, like the red nanothermite dust in the ruins of Ground Zero, the high-powered aerosolized military explosive that took the towers down on 9/11. But then, we also see what has happened as a result, the creation of the War on Terror, blamed on the Muslim’s, Osama bin Laden and box-cutter carrying hijackers, which lies gave us the right to start our ongoing havoc, still running in Iraq, Afghanistan, now Pakistan, and all points south and east. Returning to Goebbels, “That is why their carping criticisms generally focus on laughable trivialities. Whenever some unavoidable difficulty pops up, the kind of thing that always happens, they are immediately inclined to doubt everything [the administration’s 9/11 conspiracy theory] and to throw the baby out with the bath water [the truth out with blind belief]. To them difficulties are not there to be mastered, but rather to be surrendered to [lies are there to believed rather than questioned]. 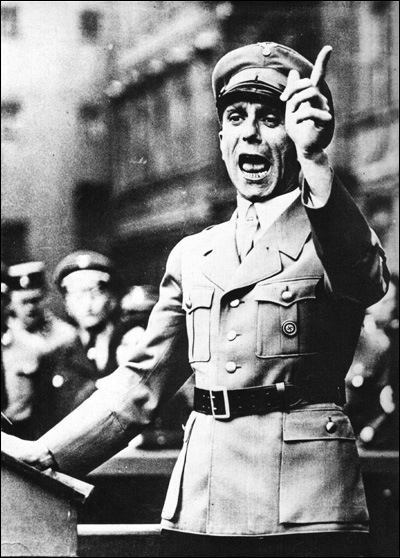 Goebbels adds, “One cannot make history with such quivering [sic questioning] people. They are only chaff in God’s breath. Thankfully, they are only a thin intellectual or social upper class, particularly in the case of Germany. They are not an upper class in the sense that they govern the nation, but rather more a fact of nature like the bubbles of fat that always float on the surface of things.” Bubbles of fat floating on the surface of things? Could that be the corpulent Goering? 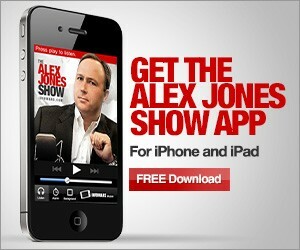 Today’s rotund Rush Limbaugh, Newt Gingrich? I’ll work on that one. Ergo, on mindless blasts of rhetoric like those of Goebbels, the Third Reich, meant to last a thousand years, fell into dust and disgrace in 12. Alas and alack, for the sake of freedom, for the future of America, to all who would turn off the light of truth, professors or thugs, presidents or prelates, philosophers or fools, czars or czarinas, I wish you all a hard landing in reality, ASAP.